Hey gents. I have been drawing up ships and systems for a couple years now. I am going to start sharing them with my current play through. These concepts come from many different games but I have a roughly consistent play style that yields similar designs more often than not. Eventually I'd like to string all of this together into a narrative history but for now I will start posting as I play. So below is the Conveyor-class in system cargo transport. This is the first successful commercial cargo vessel capable of regular manned missions produced and the three versions of this class served as the backbone of the colonial support missions that maintained Mars, Europa and her sisters and Titan during their long and arduous pioneer era. This class also has an infamous place in Terran history from is use in the first Colony War, but more on that later. 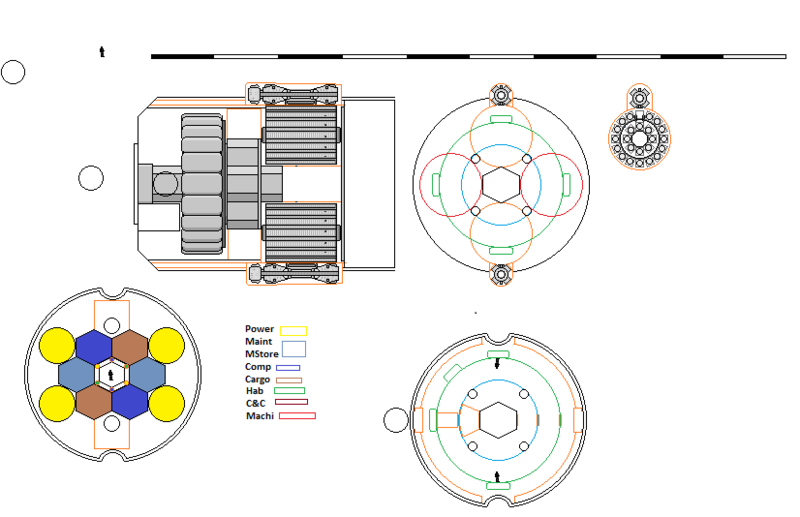 Shown is the first version using the smaller standard containers used by the first Earth space elevators. It also features conventional rocket motors as opposed to the nuclear rockets of the follow on types. Three large solar arrays are present to provide electrical power. Solar power was abandoned on later versions due to limited utility beyond the orbit of Jupiter and the arrays were replaced with expanded radiators in future hulls, the conventional solar powered vessels being relegated to resource runs to the automated mines of Mercury and Venus as well as service to Ceres when its mines came online. It was the first non experimental vessel to feature simulated gravity, slightly predating the contemporary Prospector-class geological survey vessels. Conveyor vessels were built and operated extensively by both the Earth Confederation (via CASA) and multiple commercial shipping outfits. They were retired from government service shortly after the formation of the Terran Confederation in favor of the more capable Star-class freighters though they remained active in limited civilian service from many more decades. Most were converted to unmanned automated bulk resource runners before their final deactivation. This is the conventional rocket version, so the forward module in the engine assemply is the rocket fuel, the after module is the rocket itself. The fuel module would be swapped out for a full one for the return (or further should that be the case) journey. This conventional version rarely traveled further out than Mars which had fuel production facilities on Phobos to recycle modules. These were not particularly fast, I don't remember the game speed off the top of my head but it was a long journey to get to Mars assuming favorable orbital positions. The Mk 3 Mod 1 GMLS. The launcher is designed to shoot any size 4 standard configuration missile. It consists of a magnetic rail launcher fed from a double carousel magazine encased in an armored drum. The magazine can hold twenty four missiles but typically the outer pass through bay is left empty to allow access to the inner carousel. Warshots are usually carried on the outer carousel while specialty ordinance (atmospheric probes, sensor buoys, communications relays, etc.) on the inner though any combination can be loaded. The launcher acts as a low power rail gun to eject ordinance via a missile sled which sloughs off after launch. This allows the missiles to achieve a greater intercept velocity without the need to carry extra fuel. Loading is accomplished via a external hull door adjacent to the launcher as well as a door through the armored drum. Missiles are placed in a protective magazine box that is couched inside the carousel bays to prevent catastrophic runaway damage should issues arise with other ordnance inside the magazine. Inside the box the missile is encased in a sled that provides mating to the launcher and protects the missile's internals from the magnetic launcher mechanism. The anti-ship missile displayed has a main interception burn stage and a secondary maneuver burn stage. Long range guidance is provided by a separate fire control not shown. This is a different version of the previous launcher but modified for center fire for use by vessels with different configurations. Specifically ships that require the launcher to be installed more internally. 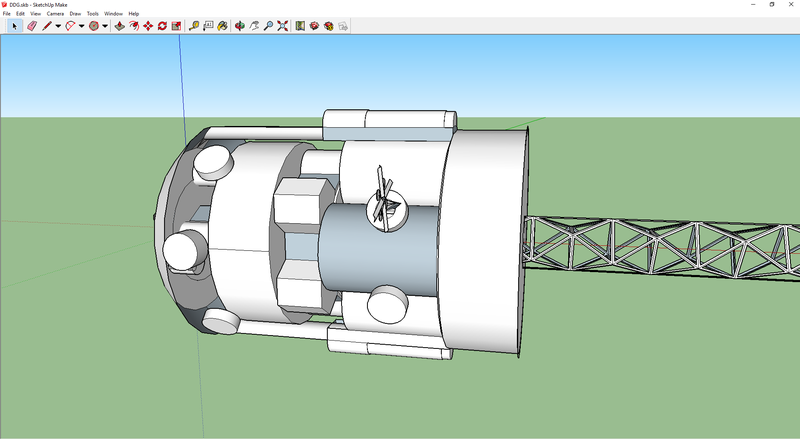 The launcher works in basically the same way except the center is occupied by the magnetic rail launcher. Due to its internal location the launcher is surrounded by a dedicated armored drum to both 1.) isolate the magnetic forces from the ship during launch and 2.) contain launcher fires from exploding or hung ordinance (the previous externally mounted launcher version could more easily vent to space). The launcher is fed by a single carousel ring via a pass through hoist. 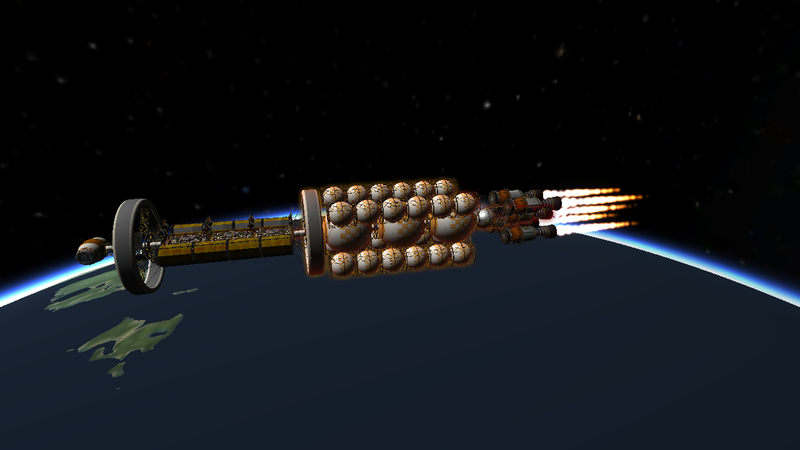 Reloading is accomplished by back feeding the missiles through the launcher. This is a somewhat more involved process than launchers with the a dedicated magazine loading door and also made underway loading from replenishment vessels prohibitively difficult though technically possible. Displayed is a series of cutaways showing the various mechanisms of the launcher/magazine system. The launcher was typically used as the primary battery for frigate/destroyers or as a utility launcher for larger vessels. With the introduction of quad packed and lager octuple packed anti-missile missiles (AAMs) large ships generally dedicated these launchers to point defense to great effect. The conveyor Reminds me strongly of the last bulk ore carrier I designed in KSP using roverdudes freight transport pack. Edit: My memory is terrible, looks nothing like it apart from the shape of the containers, hell it's hydrogen nuclear thermal too. 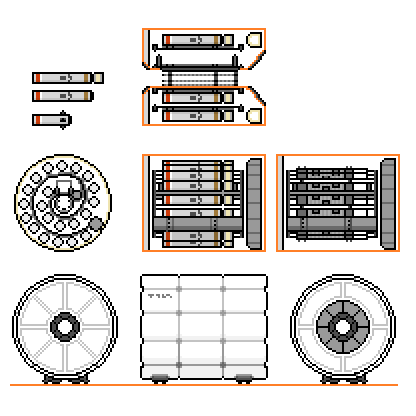 I absolutely love the line art style schematics you're using . Edit: as an ordinance geek I also appreciate the effort you've gone into actually considering the mechanical aspects of that launcher. Thanks for the kind words. You linked ship is sort of what one of the next generation of freighter will look like, with the more powerful nuclear rockets pushing the habitat modules to the front. From the beginning the Conveyor-class was designed for Thermal Nuclear Propulsion (NTR). Orbital construction preparations for the keel and main structure of the first vessels preceded the development of the NERVA NTRs which were to be built planet side and boosted into orbit. Consequently the first six vessels were designed for NTR but built with conventional Hydrogen-Oxygen propulsion. This was considered adequate for the first phase of exploration and colonization which called for regular traffic to Mars but only limited exploration missions out to the Jovian moons. In reality NTR development fell behind and the first 13 vessels were built with conventional rocket propulsion. When the first NTR hulls were laid they were designated the "Conveyor II - class." Though eventually all but five of the Conveyor-class would be upgraded to Conveyor II standard configuration, the upgrades were long delayed as the conventional powered versions proved surprisingly economically efficient inside the Martian orbit due to easily exploitable fuel sources on Phobos. The final upgrade took place 18 years after the first built from scratch Conveyor II was christened. The Conveyor II used a single NERVA NTR engine that roughly tripled the performance from its predecessor. The engine is mounted at the end of a service module that was integral to the hull vice outboard mounted like the three rocket motors of the previous configuration. 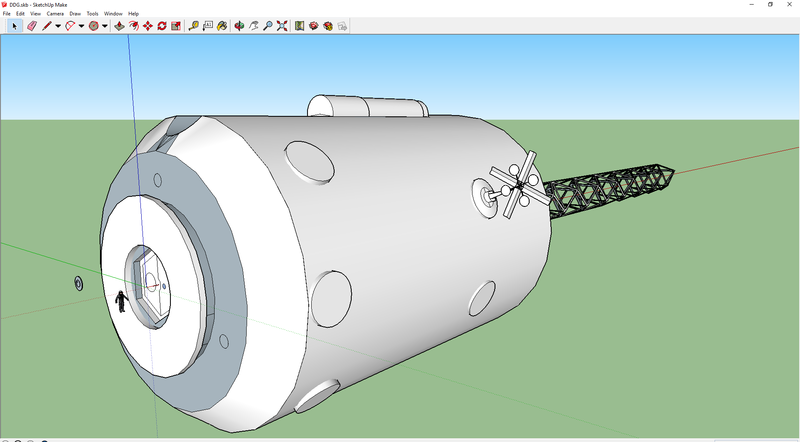 A torus made up of reaction mass tanks is then fitted around the service module to complete the engineering section. This made mission turn around significantly easier but required a slight rearrangement of the communications setup was required to prevent masking by the torus. Spare toruses were transported to and refueled at transit hubs to facilitate long range missions. The engine configuration is bi-modal providing ample electric power. The abundant on board power and intended primary operating area between Jupiter and Saturn led to the inclusion of additional radiators in place of solar panels. Due to the increased engine performace the overall vessel was lengthened to allow for a 25% increase in inter modal container berths. This proved crucial in establishing the first Jovian colonies and later the push to Titan. I like you man, you awesome motherfrakker. P.s. Those ships are frakking rad - i have a wet spot in my pants for ships that look realistic like for example those in early missions of Nexus Jupiter Incident. Geeze. That's alot of work. Nice pictures! I like the usage of solar panels. Thanks for the kind words gents. Two more versions of this guy before I move on to the next one. Hopefully a warship but there are still plenty of early game geosurvey and other ships to get through. Very nice and detailed. I don't suppose you can go into detail on how the cargo ships are loaded? Looking forward to your weapon systems. Sure. 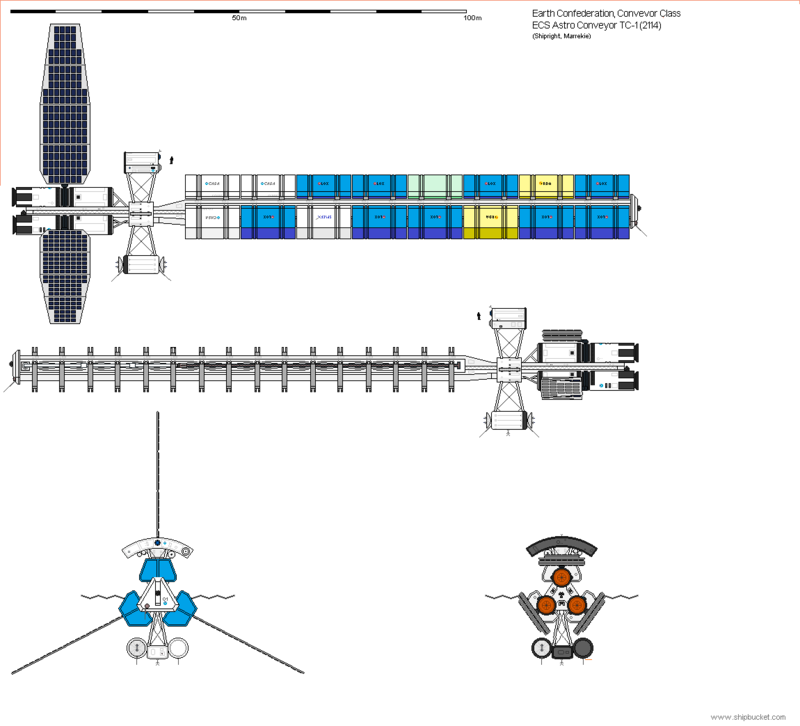 The ships are designed to transport the inter-modal containers designed to work with Earth's first space elevators. The original elevators were designed to accommodate two tracks, one going up and one going down. There were spaceports (that's my rp stand in for space elevators in game) tethered to the ends of each elevator that act as loading stations for cargo. You will notice the Conveyor series have three manipulating arms on tracks stowed between the intermodal dock rows. These can handle all loading and unloading of the ship. In practice Earth space had sufficient cargo loading equipment and tugs that the arms were not needed, but they were used extensively at the frontier colony worlds where the facilities were more primitive. They intermodal containers you see were the standard for over 50 years until the very end of the Conveyor series run, with only the Conveyor III being configured for accepting the new HEX-standard intermodals introduced wtih the second generation of high capacity Earth elevators. It should remember that bulk resource freight was primarily moved by mass drivers, though bulk carriers did exist. So will there be no follow up to this ?? How did you draw these? They almost look like AutoCAD drawings. Cool stuff in any case! I wish I had the patience and/or skill to make something like this. They are just MS paint drawings. Here is my work on an early warship, meant to exist in the 2300s our time. The armament is two size four missile launchers and two turreted laser mounts for PD. Very much a WIP as you can tell. I need more man, this stuff is like a drug. Hey guys! Not a lot of work on this over the past several months but I have one new weapon system. The Mk 5 Mod 2 MMLS. This launcher is designed to be a modular bolt on anti-ship missile system suitable for installation on a broad range of vessels, both commercial and military. Like similar systems before it, the design was made to fit contemporary intermodal container mounts for the quick conversion of various cargo carriers into auxiliary cruisers. 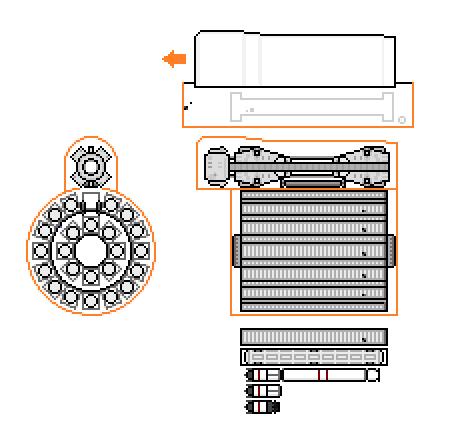 Displayed is a series of cutaways showing the various mechanisms of the launcher/magazine system. A rare follow on version, the Mod 5, included a basic active sensor package but was only used by special and clandestine forces and never saw recorded use. The system is reliant on third party targeting or a coincident MASS module. The launcher consists of an self contained drum with standard intermodal hardware for HEX-II container positions. The drum has positions of twenty-two missiles along a spiral rail magazine system, though in practice the last position inside the transfer box was left empty for safety. Missiles are back loaded through the central launch guides, with the first missile loaded being the last fired. There is no way to rearrange ordinance once loaded, making this MMLS unsuitable as a utility launcher. The transfer box consist a pass through hoist to move missiles to the launch rails. The box is armored to prevent penetration while moving ordinance. After cycling missiles the carrier carts are reversed to be stored along the under side of the spiral rail. The aft section of the drum contains a fire suppression system consisting of a ring tank with a quick expanding foam designed to suppress the nuclear rocket engines of carried missiles. The drum is armored for and aft with conventional laminar facings, while the flanks are covered aerogel filled whipple shield tiles. Missiles used in this launcher require an ejection charge to jettison the missile out of the launcher and away from the ship before the missile engine engages. These charges are conventional and make the system resemble historic recoil less rifles. The drum is equiped with exhaust area hardening to withstand the significant energies of these charges. This is required due to most vessels using this launcher not being purpose built warships with armor that can handle the radioactive jet wash from military missiles. The launcher is fitted for size 3 standard configuration missiles. In practice only four ordinance types were designed for the ejection charge required for this launcher, all being ASM warshots, and only two of those were ever used in anger from this launcher (by state militarizes). The launcher here is shown with a Gladius B ASM, the most common ordinance used along with the eariler Gladius A. The Gladius series weapons are two stage intermediate range missiles designed for massed volley fire from unconventional platforms. Under powered and under charged compared to other contemporary ASMs, they made up for their poor performance by being cheap and easy to produce, giving TCN forces a ready way to multiply their forces quickly at the onset of hostilities. These launcher lived on in the secondary and black markets long after there retirement from both Earth and later Colonial military use, being regular fixtures of freehold settlements and rebel and terrorist forces over for over a hundred years using a variety of modified or home grown improvised missile types. There are even records of the launcher being used as conventional projectile weapon, irregular forces using the ejection charges to accelerate dumb slugs for asteroid bombardment.